As winter comes, and the nights grow dark, she curls up, book in hand, and dreams away its ice. I'm an idealist, I'll admit it. I like to construct perfect scenarios in my mind – which usually involves me romanticising everything. And so, this morning, as I left my house for school and saw the faint traces of frost glazing the car windows, I was quick to welcome the chills of winter with genuine delight. Winter. Indescribably perfect winter. The best reading season? I think so. 'Is there anything better than winter?' she sighs, only to answer her own question with a firm 'no'. Winter, to me, seems to have the perfect reading conditions. With early nights lulling you into this dream-like state and the knowledge of raging wind and terrific thunder being so acutely elsewhere, it's all enough to make your bed that little bit warmer, your hot chocolate that trace sweeter and the next page a tad more intriguing. Wisps of cinnamon scented steam rise into the frost-laced air as she turns the page. Chapter One. And so she reads the cold away. For winter's bitterness only makes everything else sweeter. 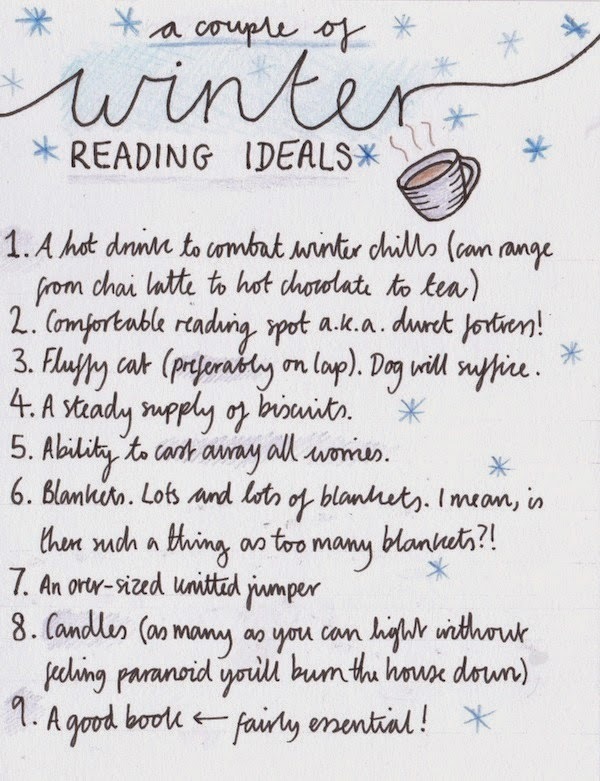 Do you share this same romanticised view of reading during winter? I know I'm factually incorrect here as, apparently, winter begins in the UK on December the 21st… but it's chilly enough for me to argue otherwise. Also, ignore the scrawled handwriting (I think my handwriting reached its peak neatness sometime last year and has now began the steady decline to illegibility…). Yes! For me, winter starts late November! I'm currently reading The Time Traveller's Wife – such an interesting concept. And yes, it is! She has a literary crime series called the Jackson Brodie series & they're incredible (first one is "Case Histories"). I loved both The Goldfinch and The Secret History! Although I enjoyed the latter more, for some reason. Winter is by far the best season, and for me it starts on December 1st - I refuse to believe that the majority of December is classified as "Autumn". Winter is a great time to read because you are given the perfect excuse as to why not to go outside. For me it just feels like the perfect time to read Classics and Fantasy so I can't wait! I've always counted November as a winter month! And I ALWAYS imagine reading scenarios like this, but I'll never end up carrying them out cause I run out of time! Too much procrastinating! Yes, same! I definitely procrastination too much as well! Wow, great post! Now I wish it was actually cold where I live, so I could be that cozy. But no, all I get is sweater weather. Winter is a wonderful reading season. I find that I have a tendency to read thicker books in the wintertime because...heh, I'm definitely not going outside anytime soon. I'm a sucker for tea, thick socks, layers of blankets, and my "corn bag" which is really a energy efficient heating pad (it's a bag filled with dry corn, and you zap it in the microwave for a minute, and it keeps you super-cozy-warm for an hour or two.) along side a page-turner. Same! I always decide to tackle all the 500+ page books during winter. :) That sounds like the perfect scenario! 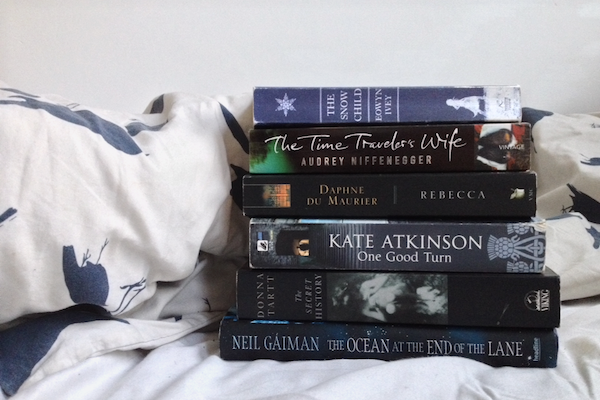 It definitely is a wonderful reading season. I LOVE this post. Everything you said was so on point. It snowed where I live almost a foot last week and I was inside curled up with a blanket some chai tea and a good book because how could I not spend a snowy day reading inside, with a candle lit of course :) I have to agree completely that winter is the perfect reading season.